The UFC 236 pay-per-view (PPV) took place from the State Farm Arena in Atlanta, Georgia last night (Sat. April 13, 2019). The event was the first UFC show to air exclusively on ESPN+ PPV in the United States. The Atlanta crowd turned out for the event with a total attendance number of 14,297, and the gate was $1,908,721. Some well-deserved bonuses have also been awarded. In the co-main event, Israel Adesanya defeated Kelvin Gastelum on the judges scorecards for an interim middleweight title. Both men put on an absolute war, which resulted in one of the best 185-pound title fights of all time. It was announced that both men will receive an extra $50,000 for the Fight Of The Night bonus. Of course, in the main event, an interim lightweight title fight took place. UFC featherweight champion Max Holloway jumped up to 155 pounds to face Dustin Poirier. 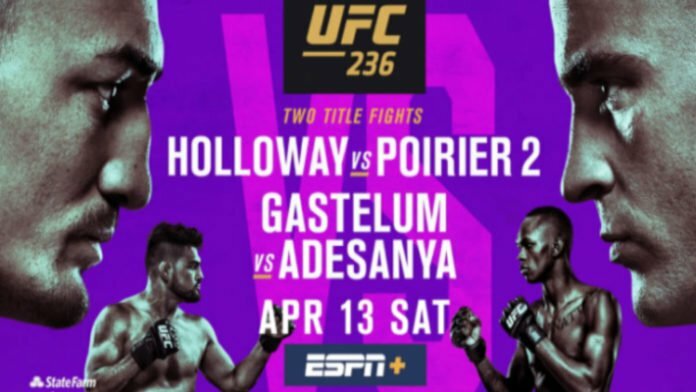 After such an epic clash between Adesanya and Gastelum, Holloway and Poirier certainly dissapoint. They put on an absolute war of their own, which “The Diamond” edged out on the scorecards. Holloway and Poirier will also take home an extra $50,000 for Fight Of The Night. What do you think about the UFC 236 bonuses awarded out from last night’s fights?